What would you do with the power of a god and the struggles of a mortal? When one part of your life is to oversee your Territory and guide your worshippers to a better life and another has you struggling to pay the rent or go out on a first date. What would you do? You play Part-Time Gods, of course. 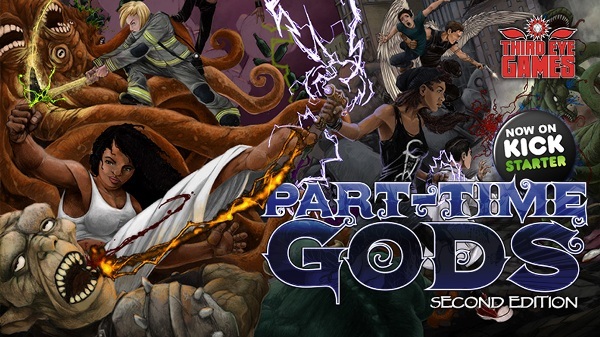 And today we’re happy to announce the launch of the Part-Time Gods Second Edition Kickstarter here. Part-Time Gods Second Edition is a roleplaying game about modern gods who must balance the mortal and divine natures of their new life. The game has many inspirations, from American Gods, The Almighty Johnsons, Thor comics, and the Percy Jackson novel series to name just a few. You’ll explore what it’s like to gain awesome divine power, battle world-threatening outsiders, and develop relationships with fellow members of your pantheon. Of course, being a god doesn’t pay the rent and it doesn’t excuse you from missing your sister’s wedding. You’ll need to make tough decisions to make it as a divine being in modern society—do you have time to help your fellow deities fend off impending doom before your sister walks down the isle? This game has a wealth of potential to explore stories about budding romances, the interactions of a pantheon making friends with enemies, and unlocking strange mysteries the universe would have preferred to stay secret. Every god has their good sides and their bad, each one creating a new window into who they are as people, but, when used correctly, opens the game to a host of story potential. Part-Time Gods Second Edition uses the Chakra System (from Ninja Crusade 2e) and is once again lead by Eloy Lasanta and a talented team of writers. Download the Part-Time Gods Second Edition Preview here for yourself and discover the depth of adventure at your fingertips! The Second Edition contains everything you need to play, whether you’ve never taken on the mantle of a part-time god before or have thrived as part of a Pantheon. It’s time to become a part-time god! Nest in the Dark – a Brand New Star Trek Adventure!